Large number of young aspirants wants to make their career in Indian Armed forces appeared for the NDA exam which conducts every year by Union Public Service Commission. In this challenging and highly competitive world every individual study hard and give their best so as to clear an exam and make their way towards the dream to get fulfill. Candidates who appear for the exam start preparing for the exam as per syllabus months before the actual date of exam. To qualify the exam, candidates start preparation with the help of number of books available online in various websites. Here, in this article we have provided the lists of the NDA Preparation Books or Guides which are available online. Candidates can download the books via online mode in the PDF form and start their preparation. Candidates who are searching for the ebooks to free download in Pdf format which cover all the topics that is likely to come in written exam. To get admission in NDA it is important for candidates to qualify the written and Interview phase of selection. Most of the candidates who are looking for the NDA exam books (pdf) can go through with the details given on this article. Candidates can download the free NDA exam book for preparation as given below. It is very usual that candidates who first time appears for the exam generally get confuse about that book to be refer for preparation of NDA Exam. 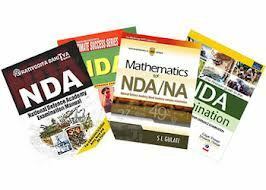 The list of books as available here are important study materials and books require for preparing the NDA Exam. There are also certain a book consists of Solved and Unsolved Previous year Question paper. By practicing from these books help candidate to score good marks in the exam. The Books which are listed below is available in English & Hindi language of different subjects. These books are easily available online in various sites. There are thousands of books available in the websites of all subjects as per syllabus, so the candidates can download these books and start their preparation. The exam will consists of objective type multiple choice questions. The question paper consists of 2 parts. Part I is Mathematics and Part II is General Ability. Mathematics carries 300 marks whereas General Ability carries 600 marks. The question paper will be of total 900 marks. The time duration will be 2 ½ hours. The medium of question paper is in Hindi as well as English Language. Complete Package NDA/NA Entrance Exam1st Edition by Tata Mcgraw Gill. Rashtriya Raksha Akadami Avem Naval Akadami Pariksha Pichle Prashan patra (Hal Sahit) by Editorial Board.